Get creative with your photos! Maybe it’s a trip to the beach, concert or night out with friends. Winner will be chosen based on creativity. One entry per day, per person. The more you enter, the more chances you have to win. Entry requirements must be completed by 11:59 PM PST on July 31, 2017 to be eligible. Entries are only valid if posted on public social media accounts. Mossy Nissan is not able to see or qualify any entries posted on private accounts. 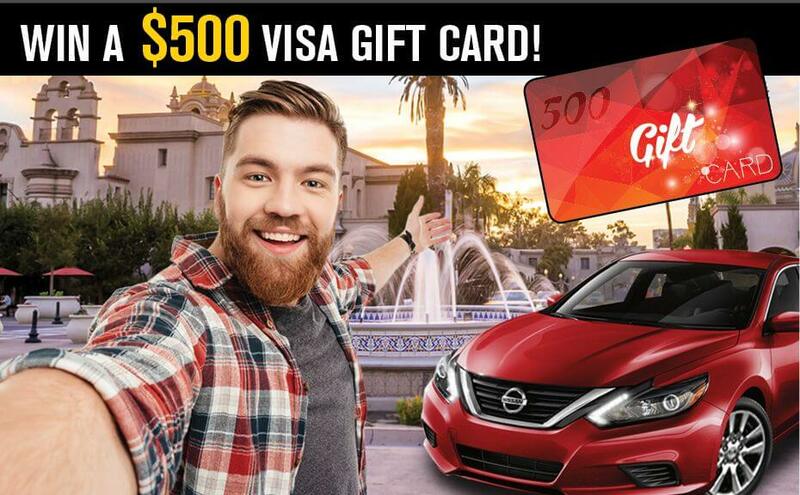 One entrant will win a $500 Visa gift card on August 2, 2017 courtesy of Mossy Nissan. The Grand Prize winner will be chosen based on creativity of photo and notified through their social media account on August 2, 2017. Winner will be given 24 hours to claim prize from initial contact. Entrants will be responsible for picking up their prize from the Mossy Nissan dealership of their choice. Odds of winning depend on the number of entrants received. By participating, entrants agree to be bound by these rules. Winner will be chosen and awarded at Mossy Nissan’s sole and absolute discretion. The prizes awarded are not transferable and not redeemable for cash. One Grand Prize winner will be selected from all valid entries. Entrants must enter the contest in the previously mentioned manners by 11:59 PM PST on July 31, 2017 to be eligible. The odds of winning depend on the number of entries received. All decisions made by Mossy Nissan are final. The Grand Prize winner will be announced and notified via their social media account on August 2, 2017. Mossy Nissan will not be liable for inability to notify the winners, whether due to inaccurate entry information, social accounts set to private or otherwise. If an entrant is found ineligible or if they do not comply with the Official Rules, then the potential winner will be disqualified and an alternate winner will be selected. Entrants must be legal residents of the state of California and 18 years or older. Employees of Mossy Nissan and affiliates of its advertising and promotional agencies and their immediate families and any persons with whom they reside are not eligible. By entering the contest and accepting the prize, the winner (a) releases Mossy Nissan from all liability with respect to this contest, including entry and participation and use of the prize awarded herein, and (b) except where legally prohibited, consents to the use of his/her name, entrant photo and likeness in print, broadcast, internet, social media and other media for advertising, promotional and/or marketing purposes without additional compensation.